The mitochondrial complex I plays a central role in cellular respiration and energy metabolism. The ~1 megadalton L-shaped protein complex is the largest protein assembly of the respiratory chain and now the largest asymmetric membrane protein assembly solved to date. Professor Leonid Sazanov and his British collaborators published the nearly complete atomic structure of the ovine (mammalian) mitochondrial complex I at 3.9 Å resolution, solved by cryo-electron microscopy aided by crosslinking/mass-spectrometry mapping in the scientific journal Nature. The respiratory chain is responsible for most energy production in humans. Several large protein assemblies are embedded in the mitochondrial lipid membrane. The mitochondrial complex I is the first and largest complex in this chain. Metabolites derived from food are processed by this enzyme complex in order to contribute to the electron transfer and proton translocation. So far, research groups were only able to reveal mostly poly-alanine models lacking necessary full atomic details due to the fact that huge and complex molecules are difficult to examine with current methods. 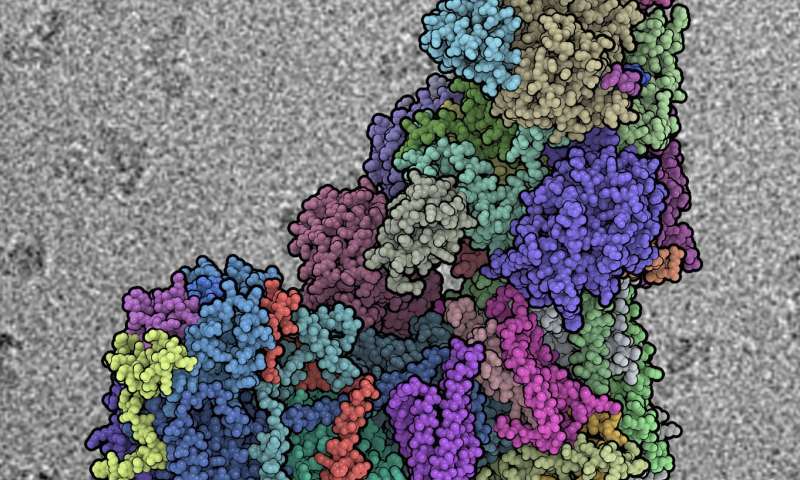 Cryo-electron microscopy made huge advances in recent years due to the development of new direct electron detectors, allowing high-resolution studies. The resolution of the structure at an atomic level now allows the understanding of the intricate arrangements and interactions of all 45 subunits (14 conserved core and 31 mitochondria-specific supernumerary subunits) with implications for the coupling mechanism and its regulation. The insight into mechanism, assembly, maturation, and dysfunction of complex I allows a detailed molecular analysis of disease-causing mutations and affected enzyme activity. Therefore, the publication in Nature is expected to serve as reference source of information in medicine, bioenergetics and other research areas. The research group aims to understand the structure and function of membrane proteins and focuses on the determination of the structure and mechanism of respiratory complex I.